After being an intuitive healer for 9 years, first embracing Spiritual Healing and then Angelic Healing, Kevin underwent an initiation through the Archangel Metatron into a system of healing that Metatron called Angelic Reiki. Through the winter of 2002 and spring of 2003, a system of healing was passed to him, which we now teach throughout the world. During this period of initiation he was approached by two friends who said they had been guided to give him Reiki Master Initiations in both the Usui and the Shamballa traditions. After these initiations he was given the Angelic Reiki system. Its basis and its means of transmission are through the traditional symbols of Reiki. Unlike an attunement in traditional Reiki, these symbols are given to the student by an angel who opens up a space behind each student and anchors in the symbols in the traditional chakras, whilst the Reiki Master holds the space. The Archangel Metatron and the Sarim, the Chief Celestial Archangelic Princes also give an attunement into the Angelic Vibration. Indeed the whole period of an Angelic Reiki workshop is used by the angels to change the molecular spin and DNA structure of the student so they become more attuned to the angelic vibration and become perfect channels for this energy. 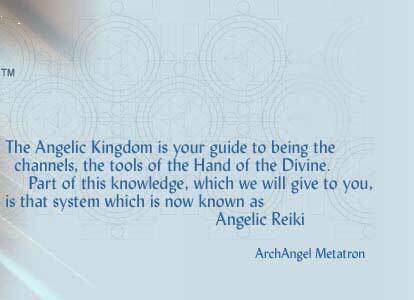 When the traditional Reiki system was given to mankind at the time of Atlantis, it was intended to align mankind with his Divine Nature, his Divine Inheritance. All illness comes from a disconnection from the Divine. To be Divine is to be in perfection. Illness comes from a belief that all is not perfect, that there is imbalance, that there is dis-ease. One cannot be ill and also know that one is Divine. As man descended into materialism and lost the connection to the Divine after the fall of Atlantis, the imprint of the Divine was also disconnected from the Reiki symbols. They still had power but their ability to retune a person their Divine Nature was lost. The time has come to re-establish that connection and this is now done through the symbols given in Angelic Reiki. There have now been a number of Angelic Reiki Masters in this system practicing throughout the world and much has been revealed to us about the process of Ascension and its affect on the bodies of humanity. We would like to now share this information with you. We are all aware that the vibration of the planet and all kingdoms within and on it are changing. This is causing cellular changes, the activation of extra strands of DNA and the activation of our energy or Lightbodies. As our vibrations raise and our Lightbodies activate, it causes a descension of our Soul energy, which anchors into our physical bodies through the Thymus Gland. The physical effect of this is heart palpitation or arrhythmia. The heart beats very fast and irregular and causes fears about heart attacks etc to arise. This is a challenge to our own views of mortality and the programming of fear of death comes to the fore. This occurs because the heart beats to the rhythm of the Universe on the physical/etheric plane. With the descension of Soul energy this rhythm is raised to Solar and Galactic level. As the heart adjusts to this new rhythm you get the palpitations coming in periodically. Kevin has had this occur over the last nine years, and admits that he did go to the Emergency Room or Outpatient Department once. While he was waiting for attention, however, he was assured all was well by his guides and he left without seeing a doctor. All has been well since. We have come across a student in Greece who had suffered from this condition a number of years ago and went to the doctor. They performed many tests and found nothing wrong. They operated however and she now has a pacemaker and has to take daily medication. 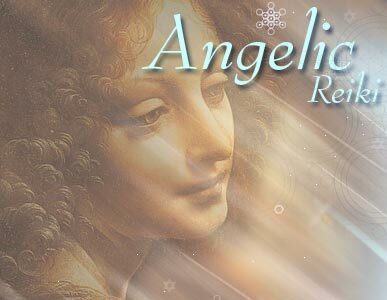 We are assured by the Angelics that this condition is perfectly normal in Ascension and those of us who are going through this should not panic and know all is well. This activation through the Thymus brings us to the subject of vaccinations. Christine as a homeopath of many years and many other homeopaths are agreed that vaccinations can close down the Thymus Gland. As we have shown, the Thymus is a major vehicle for the Ascension activations. In fact, the whole of the Endocrine System undergoes massive change during Ascension. It does not matter when we received vaccinations. If we had to undergo a vaccination in the past it will affect how you integrate the energies of Ascension. As we begin to clear past life karma, it is done in a major way through the thymus. It is our link with Soul energy through the thymus that allows us to raise our consciousness to a high enough level to look back and clear our karma. As awareness of how vaccinations can affect us in a negative way grows, people are beginning to make an informed choice. For those of us who have had vaccinations, healing by the angels can be done to clear the negative effects caused. The condition known as Vaccinosis Syndrome is caused by the downpouring of Soul Energy and the resistance of a Thymus damaged by vaccination. This affects the whole of the Endocrine System and leads to symptoms resembling Glandular Fever. One of the symptoms of Vaccinosis is extreme tiredness. Many lightworkers know what it feels like to get suddenly very tired for no apparent reason. There are many varied reasons for this apart from the reason above, all to do with the Ascension process. As the cells in the body change and begin to metabolise Light as a food source, the increased intake of energy into a cell causes it to release stored trauma and karmic memories. The body is flushed with an excess of energy bringing tiredness, aching joints, sore throats, viral symptoms, nausea and diarrhoea. This is part of the Lightbody process activated on the whole planet as early as 1988. The condition known as ME has a direct correlation with this process. Again, the healing given now through Angelic Reiki and other energy healing systems is available to bring balance to the these effects caused by the Ascension process. We have also found that there are certain vitamin deficiencies that need to be addressed as we change our metabolism from a carbon base to a silicon base. These changes occur through the spleen, which is the major physical organ in the body for passing prana from the etheric body into the physical. All lightworkers on the planet could be as much as 76% deficient in Phosphoric Acid, which aids the changes occurring to DNA. Also the Vitamin B Complex is needed to support the changes to the Endocrine System. The Vitamin B Complex and Phosphoric Acid can be taken as a supplement and the New Era Tissue Salts remedies are very good for restoring balance. We would now like to touch on one of the most important aspects of this system. There is awareness among spirit-minded people in the world that special children are now being born. These have been termed Indigo, Crystal or Rainbow children. Indeed this is the case. Many souls who inhabit the Galactic Races are now incarnating on the planet to help raise the vibration in consciousness by contributing to the collective human consciousness vibration. Connections are now being re-established with certain Galactic Races, with whom humanity has bonded before, through the merging of these races into the genetic makeup of Humanity at consciousness level. There are also many Angelic Incarnations occurring as the Angelic Kingdom and that of Humanity move closer together. This has been pre-ordained to create a merging of the two Kingdoms for a distant time in the future when Angels and Humans will move into a period of Stellar Co-creation. We have asked and received the information that about 20% of all children born today are of these lines. These Star Children generally tend to choose parents where one or both are on the spiritual path, or where a close relative, who is on the path, will undertake the guidance of that child in the early years. These children are coming into incarnation through the normal birthing process. There are certain signs in a pregnancy, which may indicate if the child being carried is a Star Child. The most obvious is that the feelings of sickness and discomfort do not dissipate after the first six weeks but continue for as long as six months. There may be small discharges of blood giving rise to the fear that a miscarriage may be occurring. The mother may be certain that a communication is occurring between her and the child in her womb, and she may become very aware with her psychic perception increasing. She may also feel that she has 'separated' in some way from everybody else including her partner and be very much in the wonder of the pregnancy to a greater and deeper level than usual. What occurs in the case of an angelic incarnation, but not to the same degree in a galactic incarnation is that the vibration of the consciousness coming in is of a higher vibration than that of a human consciousness. The angelic and human vibrations are not the same and are far removed from one another. The incarnating soul finds it difficult to match the patterning prepared as a human consciousness template to that of the angelic. A great deal of adjustment needs to be made to merge to two consciousness patterns to create a homogonous whole. This has an effect on the endocrine system of the mother and of the newly forming foetus, which causes the symptoms described above. Kevin has been called as an Angelic Reiki Healer to mothers who are going through this type of pregnancy. The crucial time is the first six months. A healing is needed at least once a month whereby the healer is used as a channel in the physical, to allow the delicate adjustments in the energybody of the mother and foetus to be made. It is during this time that the mother may experience lower abdominal pain and some bleeding. From six months onwards all should be well with a healing just before the birth advisable. The emphasis on this healing is to transmit to the incoming consciousness the continued connection to the Angelic Collective. Angels are an extension of the Divine Mind. They are a projection of the divine seeking to anchor into a consciousness grid that has been disconnected from this vibration. It is the integration of this powerful divine consciousness vibration into a vehicle that is of a lower order that can cause problems. It is therefore advised that all mothers who feel they are carrying a Star Child seek out an Angelic Healer or an energy healer who works at Galactic Level. Women are taking the decision to have children at a later age and are using the procedure of Amniocentesis to check if the chromosomes of the foetus are normal. We would again caution mothers as to the problems of this in relation to the above. The children being born at this time are now coming in with extra strands of DNA activated and extra chromosomes. The medical profession in the minority is aware of this situation but not the majority. The reasons for this can be intuited by some but are too complex to be gone into here. A doctor may give an unfavourable diagnosis of this test without passing to the parents the exact readings. The lack of the chromosome, which causes Mongolism, is specific. ANY unnatural readings may cause the physician to give an unfavourable diagnosis. Again, the consultation of an Angelic Healer or energy healer would help to reassure the mother that all was well. After these children are born they need to be cared for in a specific way. These children regard humanity as the children. Kevin has three children, two angelic and one galactic. He can speak from experience when he says that these children resent being treated like children. He has always been guided to treat his children as adults even from the earliest age and has been richly rewarded. The problem, if it is such, comes when they enter the school system of whatever country. They find the subject matter exceedingly tedious and simply become bored. This is often wrongly perceived as confrontational or disruptive by the establishment. In America , this has been diagnosed as Attention Deficiency Syndrome, with mind suppressing drugs being prescribed such as Ritalin. There are many books emerging which gives guidance to parents of such children, one of the best being "The Care of Indigo Children" by Doreen Virtue. These children also suffer from a sense of not belonging and experience deep grief without cause. A consultation with an Angelic Healer will clear this as a connection will be made to the 'home' vibration, and the child will be more content. Vaccinations for these children should be resisted for the reasons given above. Lastly, we turn our attention to what Christine calls in homoeopathic terms Miasms. The Ascension Process is in effect the culmination of three great cosmic cycles coming to an end in the year 2012. We are energetically entering into a band of energy which emanates from the centre of a Galaxy known as the Photon Band. The effect of this band of energy is to increase the atomic spin of all photons, which are light particles or packets of electromagnetic radiation of which all matter is composed. The effect of this can be seen in the gradual increase in surface temperature of the earth at this time. In the human body it is causing programmes of illness inherited from our parents and ancestors, which are anchored in our DNA, to spontaneously activate. Kevin has experienced this quite markedly in the last 20 years. His first challenge was to overcome chronic depression inherited from his great, great grandfather. Next, in 1995 he was diagnosed with chronic bronchitis, this being a gift from an unknown relative. Then, in 2006 he was diagnosed with mouth and neck cancer. In the last five generations of Kevin's family at least one member of that generation has died from cancer. As this condition was particularly painful we consulted a specialist doctor, who convinced us to undergo surgery. After the surgery, however, we were told that Kevin needed three months chemotherapy, followed by six months radiation therapy. If he did not do this, we were told, Kevin would not see Christmas 2007. We declined. In all of the illnesses listed above the only treatment that Kevin has relied on is Angelic Reiki. At the time of writing this article in March, 2007, all of these illnesses no longer exist. He jokingly refers to the fact that he contracted these illnesses to prove the effectiveness of Angelic Reiki. After integrating with the energy of Cancer, Kevin has a unique perspective on what this illness actually is. At one point in this illness he literally had a foot in two worlds. As part of the 9 day Angelic Reiki workshop, and only in this workshop, Kevin will describe his conversations with the entity known as Cancer, and give a detailed account of the process we will all go through known as death; where we'll end up, and the choices available to us if we choose to incarnate again. It must be fully understood that we are not advocating a total boycott of the medical profession. It is of course essential to get a medical diagnosis if there are any physical symptoms that cause concern. To simply ignore the messages that our bodies give us is paramount to burying out heads in the sand. Physical symptoms are our greatest teacher and need to be honoured. We are in a time where we are embracing our own power and autonomy based on informed choice. It is a fact that current medical thought does not accept the latest scientific research (see www.whatthebleep.com), also practitioners in the medical system feel they need to be seen doing something, even if they are unsure of the cause of a condition. Unfortunately, this something can be the prescription of abrasive drugs or invasive surgery. This is where each individual has to make an informed choice based on their own truth and discernment. What we have tried to show in this brief dialogue is how, through the wondrous process of Ascension, we are all changing. Whether we are aware of it or not, the processes described above are occurring and have passed the point of no return. Many of us are here, in this incarnation, to support this process. We are in the culmination of many lifetimes on this planet where we anchored energy and teaching into Humanity to support us in this work, in this lifetime. As more and more emphasis is now being directed into recognising that ALL is energy, both in the scientific and medical communities, we as Masters of Energy are now being called upon to anchor these new healing modalities, which are coming in to support these changes. Although Angelic Reiki is just one of many of these modalities, it is the one chosen to anchor the purest Divine and Angelic vibration at this time. Kevin and Christine Core are the co-founders and Master Teachers of the Angelic Reiki System, as passed to them from the Archangel Metatron. This year, they are to teach this system in Greece , Oregon , Texas , and Sedona USA , Egypt , South Africa , and England . This system has been chosen by the Angelic Kingdom to be a channel for one of the purest streams of Angelic Energy to be anchored onto the planet at this time. It is a catalyst for change and has transformed the lives of all who have participated in these workshops. For further information please contact us by following this link and also take time to visit our other websites.